Get the free Sanctum Secorum #34 Companion HERE! Prospero, a tall, skinny misfit of a wizard, lives in the South Kingdom—a patchwork of feuding duchies and small manors, all loosely loyal to one figurehead king. Along with his necromancer friend Roger Bacon, who has been on a quest to find a mysterious book, Prospero must flee his home to escape ominous pursuers. Thus begins an adventure that will lead him to a grove where his old rival, Melichus, is falsely rumored to be buried and to a less-than-hospitable inn in the town of Five Dials—and ultimately into a dangerous battle with origins in a magical glass paperweight. Welcome to the Sanctum Secorum podcast. 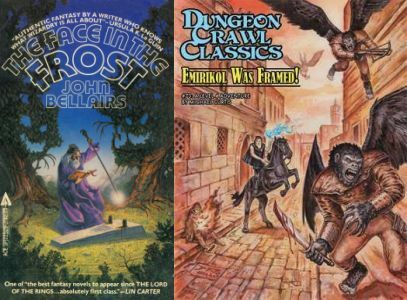 Tonight we look at a work by John Bellairs, The Face in the Frost and match it up with Michael Curtis’ Emirikol was Framed! Get the free Sanctum Secorum #28 Companion HERE! The magician Dr. Erasmus Craven, who does not belong to the brotherhood of magicians, grieves the loss of his beloved wife Lenore and lives in a castle with his daughter Estelle. One day, a raven knocks on his window and Dr. Craven learns that the bird is actually the magician Dr. Adolphus Bedlo that was turned into a raven after challenging the powerful magician Dr. Scarabus that was an enemy of his father. Dr. Craven makes a potion to turn Dr. Bedlo back to his human form and Dr. Bedlo tells that he has seen Lenore in the castle of Dr. Scarabus. Dr. Craven decides to go in his coach with Dr. Bedlo to visit Dr. Scarabus and Estella and Dr. Bedlo’s son Rexford decide to go with them. They find an amicable Dr. Scarabus that invite them to stay for the night. Was Dr. Craven’s father wrong about Dr. Scarabus? Welcome to the Sanctum Secorum podcast. 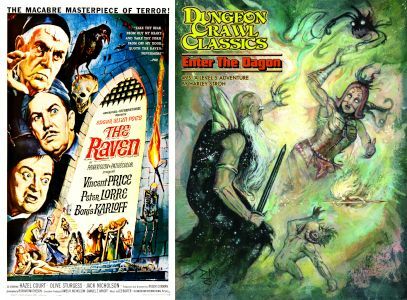 Tonight is movie night and we discuss Roger Corman’s adaptation of Edgar Allen Poe’s poem, The Raven as well as Harley Stroh’s newest adventure Enter the Dagon.